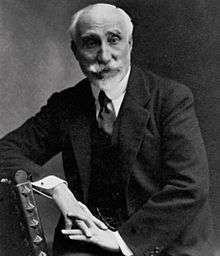 Antonio Maura Montaner (Catalan: Antoni Maura Montaner; 2 May 1853 – 13 December 1925) was Prime Minister of Spain on five separate occasions: 5 December 1903 – 16 December 1904, 25 January 1907 – 21 October 1909, 22 March 1918 – 9 November 1918, 14 April 1919 – 20 July 1919, and 13 August 1921 – 8 March 1922. Born in Palma de Mallorca on the Balearic Island of Majorca, Maura studied law in Madrid. In 1878 Maura married Constancia Gamazo y Calvo, sister of Germán Gamazo y Calvo. They had several sons and a daughter together (see below), many of whom have been prominent in Spanish and European history. He entered the Cortes Generales in 1881 as a liberal delegate for Majorca, but later joined the Conservative Party. In 1886 Maura was elected as vice president of the Congress of Deputies. As prime minister, he created the Spanish Institute of Provission and he attempted to carry out a reform plan, but this was opposed by the liberals. He fell from power after his suppression of an uprising in Barcelona in 1909, called the Tragic Week. The execution of Francesc Ferrer, who was charged with leading the Tragic Week uprising, provoked a European-wide outcry which contributed to Maura's downfall. Maura was a hero of a youth movement, the Mauristas, who wanted him as a new head of state of Spain at a time of substantial resentment of King Alfonso XIII. This and Maura's ambition caused him to fall out with the King. Maura later headed coalition cabinets with other parties (1918, 1919, 1921–22), but he did nothing to advance unconstitutional methods. Many of his followers later supported the dictatorship of Miguel Primo de Rivera, but he remained aloof from both Primo de Rivera and King Alfonso XIII. Maura had first entered the political arena to fight the "caciquismo" culture, which he considered a cancer of Spanish political culture and the main obstacle towards authentically democratic institutions. When he was Prime Minister during the reign of Alfonso XIII, he spent summers at the estate of Can Mossenya, historically part of the Valldemossa Charterhouse in Majorca. Chopin and George Sand had stayed there in the previous century. Azorín traveled from the continent to meet Maura there. Maura became a prolific watercolorist, often painting scenes of nature or old buildings from past eras. He died in Torrelodones, Madrid in 1925. The International Foundation Can Mossenya named an entrance to its historic estate the "Gate of Friendship – Azorín and Maura" after the men's encounter. Jaime Semprun (great-grandson) writer, essayist, translator and editor. Ricardo Semprún (great-grandson) Spanish diplomat. Pablo Semprún (great-grandson) professional paddle tennis player. 4 times Spain's champion. Wikimedia Commons has media related to Antonio Maura.